Thanks to NetGalley and Ten Speed Press for the ARC of this book. This is a beautiful vegetarian cookbook. It has a wide range of vegetarian recipes inspired by all corners of the globe. The recipes are illustrated by stunning colourful photography, with lovely full page photos which make the food look very attractive. I thought this seemed a slightly odd choice. It probably would have been more useful to divide them by seasons, or into meal planners, such as whether they were everyday options or food for friends. Th introduction isn’t particularly interesting. 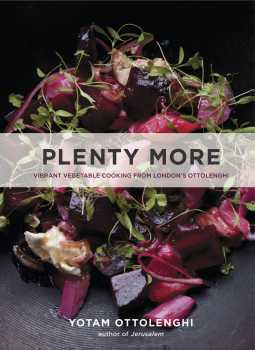 It felt more like an advert for Ottolenghi’s London businesses rather than an insight into his food ethos or what the recipes in the books were suitable for. The recipes seem quite simple. In spite of the fact that they often seem to have a large number of ingredients, the instructions are usually very short. There are short introductions to each recipe with information on what to each the recipe with or explanations of strange ingredients or the heritage of the dish. There’s not a great deal of additional information with the recipes, for example there is no nutritional information such as calorific content. The ARC I received must be the American version of the book as it used ingredient names such as arugula and cilantro rather than rocket and coriander. It also has American measurements such as cups. As Ottolenghi is based in London, I assume there is a British version of this book with English ingredient names and weights. Ottolenghi is renowned for using hard to find ingredients. I don’t this most of the recipes in this book are too bad. Although there were a few which contained ingredients which I would not be able to find in my local supermarket/town such as daikon, kohlrabi, barberries, pomegranate molasses, tofu puffs, labneh and pandan leaves. There were also a few which contained ingredients I had never heard of such as dakos (Cretan barley husks), brown beech mushrooms, panch phorah, shiso leaves and lemon geranium water. So it would be important to read the recipe and plan some of the ingredients before trying to cook anything. None of the recipes appealed to me enough to make me want to cook them. However, I’m pregnant at the moment with cravings for carb-heavy bad for you food and an aversion to anything green, so these vegetable-heavy recipes which would normally appeal to me are less attractive at the moment. However, I may try out some of the strange sweet dishes. I like the sound of Grilled banana bread with tahini and honeycomb. Overall, this seemed like an interesting recipe book which would be a good addition to any veggie’s shelf. Thanks to NetGalley and Rodale Inc for the ARC of this book. 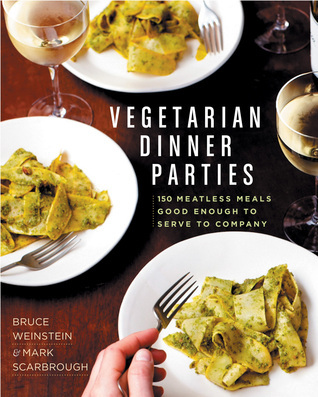 This is an amazingly through cookbook, packed with advice on hosting a successful vegetarian dinner party. Each recipe has extensive notes including explanations of strange ingredients; what parts of the recipes can be made in advance; ideas for garnishes; what other dishes and drinks would go with it; and tips for preparing dishes more quickly. However, they do not include information on overall prep and cooking times or the nutritional/calorie content of dishes. I guess the latter is less important when planning food for dinner parties rather than everyday food. Despite the wordiness of the advice and notes around each recipe, the actual instructions for the cooking steps seem simple and concise. There’s a wide range of recipes, including lots of vegan options. In fact half of the recipes are vegan and these are clearly marked. Many of the dishes seem quite autumnal/wintery with lots of hearty sounding stews and casseroles. The book ends with a nice suggestion for a parting gift for your guests, a recipe for homemade granola which you could give them in jars. I’m slightly obsessed with making my own granola at the moment, so I loved this idea! There are not enough photos of the finished dishes. I’d estimate probably on 1/3-1/4 of the recipes have an accompanying photo. I much prefer cookery books where every recipe has a photo. Particularly when you are planning food to cook for friends, it helps to know what the dish should look like and have some ideas for plating it up. I found the overall style of this book a bit patronising and verbose. As well as including recipes, there’s a lot of advice on planning your dinner party. I’d say there’s a bit too much information, such as the inclusion of a suggested playlist (unnecessary) and a rant against the use of paper napkins (who cares?). The introduction is incredibly wordy and spends a lot of time trying to convince you of the benefits of eating veggies. This doesn’t seem necessary as I would have thought the vast majority of people picking up this book and reading the introduction are probably sold on this idea already. I’ve not had the chance to host a dinner party yet to try out the recipes from this book but I’ll definitely consider some next time we have guests. 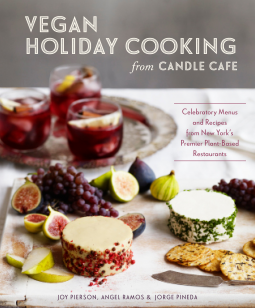 I had never heard of the Candle Cafe, but I’m trying to eat a more vegan diet, so I thought I would check out this recipe book. From the title I expected this book to contain Christmas recipes; however it actually has recipes for a slightly peculiar selection of special occasions including Valentine’s Day, The Super Bowl, Passover and Cinco De Mayo as well as Christmas, New Year and Thanksgiving. As you can probably tell from that list, it’s a pretty American cookbook. But that’s to be expected as Candle Cafe is a New York based chain of restaurants. However, I’m fairly sure I wouldn’t be able to find all of the ingredients in a standard British supermarket (particularly some of the Asian ingredients). I suppose most vegans are used to going the extra mile to find specialist ingredients. The book is broken down into sections based on the different ‘holidays’. Most sections start with recipes for drinks, they also contain savoury and dessert ideas. I’m a big fan of autumnal food, so I thought the recipes from the Thanksgiving section looked particularly appealing. Pumpkin seed-crusted tempeh with roasted ginger-maple sweet potatoes and cranberry-orange relish definitely sounds more interesting than your standard nut roast! The Mexican food in the Cinco De Mayo section also looks very appetising. All of the sections contain very inspiring and original sounding dishes from lots of different cuisines. There are also suggestions for vegan versions of traditional dishes served on the featured ‘holidays’. As this is food for special occasions, most of the dishes serve about 10 people, so I would have to scale down most of the recipes before trying them for myself or my small family. The book is quite attractive, however I would prefer there to be photos for all of the recipes. There’s probably photos for about one third of the recipes. There are also photos of random ingredients, these could be replaced with pictures of actual dishes. I like the fact that all the recipes have a written description at the beginning but I do think recipes should have nutritional info such as calories and details of whether they can be frozen. The book includes introductions by famous vegans Alicia Silverstone and Woody Harrelson which are a bit cheesy, but the general tone of the rest of the writing is clear and concise. I definitely plan to try lots of recipes from this book as many sound unusual and innovative and where there are pictures, the food looks very tasty. This book looks like it could appeal to anyone, if I didn’t know it was a vegan cookbook, I’m not sure I would have noticed straight away because the food sounds so mouth-watering! Thanks to NetGalley and The Taunton Press for the ARC of this book. 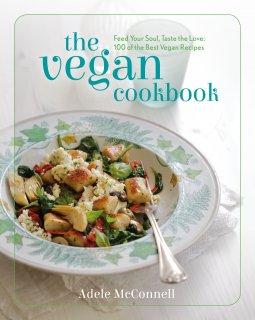 This is a beautiful vegetarian cookbook, with tempting veggie recipes and beautiful full page photos for most recipes. The book has a warm autumnal colour palette which emphasises the cozy, filling nature of the food. The emphasis of the book is making vegetarian food ‘meaty’ and substantial. The introduction includes lots of good tips and advice for cooking common veggie ingredients to get the best from them. I particularly like the tips for adding ‘meatiness’ such as using caramelised onions, miso or toasted coconut in recipes. There are a wide range of recipe ideas from cuisines from around the world; however the book has a definite ‘American’ feel to it with lots of burgers and pancake recipes. There are some very interesting ideas for meals I haven’t tried before e.g. pumpkin pear pancakes and beet wellington. There are also variations on well-known veggie staples e.g. edamame hummus. Unlike many veggie recipe books there is not too heavy a reliance on pasta and carb-heavy food. There is no dessert section, which is unusual but not necessarily a bad thing. Most of the recipes have LOTS of ingredients so I think you would have to do a special shop to make most things rather than relying on your store cupboard or fridge. Many of the dishes serve lots of people too, for example there is a breakfast pancake recipe which makes 27 pancakes, I can’t imagine ever needing that many! I like the tips which come with each recipe on what other dishes to serve to make a good meal. Recipes do not have nutritional info such as calories or details of whether dishes can be frozen, which would be helpful. This recipe book contains lots of tempting recipes which I shall enjoy trying. Thanks to NetGalley and Watkins Publishing Ltd for the ARC of this book. I’ve been vegetarian for 22 years, but recently I’ve been trying to eat a more vegan/raw food diet in order to lose weight, so I was excited to have the opportunity to review this book. As this was an electronic advanced review copy, it was slightly difficult to view the book. Ingredients lists were split over pages and recipes seemed to run into each other. Also, there was no consistency in the placement of the photos of recipes, sometimes they were before the recipe and sometimes they were after, so when you reached a photo that looked interesting you did not know when to scroll backwards or forwards in the book to find the recipe. I assume that the hard copy will be a lot better formatted and much more user-friendly. Generally, I think recipe books work much better as hard copies. This seems like a good vegan recipe book. It has recipes from a wide range of cuisines from around the world. The author has a very friendly voice and I like the personal notes she gave with most recipes. The pictures are bright and colourful and appetizing. There’s a good section on vegan ingredients at the beginning of the book, although this could have included a bit more information on where to buy the ingredients. There were a few interesting recipe ideas for things I hadn’t thought of before, such as quinoa porridge. The information provided with recipes includes cooking and prep time and highlights where recipes a free of soy, sugar, nuts, seeds, gluten or where they are raw. However, there is no nutritional info such as calories, which I find useful, also there is no indication if recipes can be frozen. The recipe order is a bit odd; snacks and treats come before main courses, so there is a random sweet section in the middle of the book before we return to savoury main dishes. The one concern I have with this recipe book is the information about soy in the introductory section. I think this is a controversial subject. The author says she avoids eating soy because it contains phytoestrogens which mimic oestrogen in the body. However, I have read elsewhere that this assertion is inaccurate and the words sound alike but soy does not affect hormone levels in the body. I think where food and nutrition are concerned it is important to offer a balanced opinion based on scientific facts. 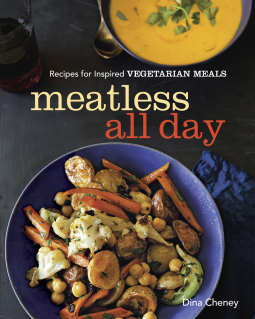 So far I’ve tried cook two recipes from this book – Warm Tempeh Salad and Spicy Lentil and Quinoa Risotto. Both recipes were easy to follow, but neither turned out particularly well, both were quite spicy but didn’t have interesting layers of flavour, instead they were pretty one-note. I don’t think I’d bother making either again, but I will try some more recipes from this book, particularly I thought the breakfast recipes looked quite interesting.